A Coy (Alpha Company) is a Star Wars Galaxies Stormtrooper roleplaying guild formed in May 2004, with a starting membership of four founding members - Alrek Torik (guild leader, Tarik Kell (Later known as Jyanix Bach), Fly Taggart (later known as Veigr Flynn), and Iesos Odathi. The guild originally settled to the Northwest of Mos Veris, the unofficial Imperial player capitol of Tatooine. However, this city was known at the time as the Imperial Stronghold for the entire server of Valcyn. A Coy’s founding members had all served as members of ISB (Imperial Security Bureau) during some of the fiercest fighting surrounding the city of Mos Veris in late 2003, and early 2004. With the Rebel attackers nearby in Mos Vegas, the soon to be members of A Coy were battle hardened and learned quickly how to engage in player vs. player combat. After learning the game for several months, and feeling that the game required a little more " Star Wars " and a little less composite armour, Alrek and the other founders decided it was time to realise the dream of having an entire formation of men in stormtrooper armour. The idea that initiated this was either Alrek or Tarik saying "Imagine a dozen players in stormtrooper armour advancing on the enemy or charging over the crest of a hill." It wouldn’t be long before that original concept was not only realised but it became a truly frightening thing to see indeed. The guildhall was erected only 500 m northwest of the Mos Veris town hall, close enough to the town to defend it, but far enough to allow A Coy to train and avoid the usual commotion of the busy player city. Soon after creating the guild, the members began to work on achieving enough faction points for their first sets of stormtrooper armour. This was no small feat and took nearly a month to achieve. At that time a set of stormtrooper armour required several weeks of completing missions at the Imperial Mission Terminal. After completing the ardous task of gaining stormtrooper armour, A Coy was ready to commence training and taking on new members. A Coy began to parade around Mos Veris, roleplaying Imperial Stormtroopers, and their usual witty banter as well as military etiquette. It wasn’t long before people started to take notice of A Coy’s activities and soon there was an influx of members/trainees wanting to join A Coy’s ranks. A Coy would regularly engage in player vs player combat in defense of Mos Veris all the while in Stormtrooper armour. At first, the armour proved to be rather ineffective against composite armoured foes, but as time went on A coy would learn the advantages of their equipment. A Coy continued to take on members. Before long A Coy bolstered around 25 regular members with a wide range of combat professions. A Coy would commonly patrol Mos Veris, guarding the town hall, and standing watch at the cantina for vagrants. Now stronger with almost a full platoon (a vision they never expected), A Coy began to have parades and full inspections in front of the city hall as a show of force; an activity that drew a lot of attention from the player base, and also reaching out to the Roleplaying community. It was around this time that Queu’ouim Oca was brought into the guild as a weaponsmith and all around crafting workhorse. He would soon be known as "Q" , alluding to the character from James Bond movies. A Coy was soon asked to participate in a number of events as honor guard, or ceremonial guard and also as a ground force, or cordon force to protect Roleplayers from being attacked by players or CSR placed NPC’s. A Coy was asked to be present for the "Trial of Pash Aylor" which would be known as one of the larger roleplaying events on Valcyn server. A Coy formed the stormtrooper guard that was placed throughout the compound. A Coy was also present as an Honor Guard at the Wedding of Lyliw and Jaye Mancoruf (Mayor of Mos Veris). After several months of assisting in the defence of Mos Veris, and carrying on with many RP activities including the permanent slaying of one jedi in downtown Bestine, the infamous Jedi publish (publish 9) went live and SWG was changed forever. This publish allowed jedi to not suffer from permanent death, and also unlocked the jedi path for all players to attempt. Soon after there was a mass exodus from the game, as jedi players were running rampant around the server, crushing all who opposed them. Soon the original objectives and goals of the game were thrown to the wayside in an all out server competition to make jedi player characters. As hard as A Coy fought, they could not compete with the strength of the jedi horde, and with Mos Veris dwindling in population it meant a drop in the number of defenders leaving A Coy powerless to hold the city. With daily attacks on the city, citizens of Mos Veris would leave and some would even quit Star Wars Galaxies in search of solace from what the game would become. Meanwhile the roleplaying community on Valcyn was forming an idea for a city of their own, which would be a pure IC (In character) player city of roleplayers. It would serve to be a self sufficient community where players could come up with their own storylines and roleplay them out, without a great deal of interference by griefers, or heavy PVPers. This city would later be called Twilight Citadel. A Coy was approached by the mayor of Twilight Citadel to become the Imperial Garrison of the region, and they gladly accepted. A Coy moved their entire guild to the city and soon after carried on with a great deal of RP and other activities. This was when A Coy really began to shine as they would often leave the area and patrol NPC cities such as Bestine, Mos Espa, and others. Their witty banter between troopers would often bring realism to the starports of the various cities, and all too often they would be mistaken for NPC’s much to the dismay of overt rebel players. After several months in Twilight Citadel the guild was stood down while the guild leader Alrek was away for summer training with the military in the Canadian Army. The members kept in touch in the event that the guild was ever reformed. After a few months away from the game A Coy officers decided it was time to return and A Coy returned to Twilight Citadel once more. A Coy moved their guild hall to the Northwest of its original location, allowing for more room - knowing that there would be a large influx of members requiring housing and drill space. A Coy would continue its actitivies, ballooning into a guild of nearly 115 members at the height of the 2nd founding. A Coy really came into its own during the 2nd Founding, not only in numbers but in skill. A Coy took on Tych Chelchu, a player combat expert who would instruct the guild members in the finer points of player vs. player combat and show them how to truly take advantage of their equipment. With the influx of players and the funds generated by having so many members at its disposal soon A Coy would be outfitted with some of the best (krayted) weaponry the server had to offer as well as quality stat buffs, and other equipment. Stormtrooper armour proved to be effective when combined with player buffs due to its low encumbrance, thus allowing stats to regenerate faster. It was during the founding also, that A Coy would engage in the first Stormtrooper inspection by Lord Vader to occur on SWG. Lord Vader (played by Sony Online Customer Support Rep. "Pex") made landfall by Imperial Lamda Shuttle and began his inspection of A Coy’s 1st Platoon on the 1 year anniversary of the guild in May 2005. After this event occurred Alrek Torik was contacted by " Wired " magazine to do an article about the event. This article can be found on the Wired site, or in the July 2005 issue. In addition, Alpha Company began raiding the server famous Slave Auctions, where players would auction themselves as slaves. Many known rebels would attend these auctions and Alpha Company would often raid them in search of these marked men. With nearly a full military company, A Coy would soon overwhelm the RP community of TC as its members would patrol constantly and prevent any violations of Imperial Law from occurring. Their popularity, and infamy would soon begin to react poorly with the RP community because of the overwhelming numbers and ever-presence of the guild. With another summer of Military training coming for both Alrek and Veigr (Fly), the guild decided once more it was time to lay-low and stand down for the summer. Members were issued their leave passes and the guild tag was removed while the unit was stood down. After yet another summer away, A Coy ’s founders just could not live without their SWG, much less their A Coy, so they decided to return, and with the help of " Q " they arranged to have a player city 2 km east of Twilight Citadel. This would allow them a secret base to form a comeback without the attention of the Rebel Alliance. The base was known as Compound Omicron. After forming it was only a matter of time before the news of the reformation got around to the members, and soon their numbers were operational once more. The intent was for Omicron to be a secret base, but it was not long before the Rebels had figured out that A Coy had returned and began to scout Compound Omicron for strength. Soon the rebels were well aware of the presence of A Coy and they began a campaign harass A Coy. The leaders of A Coy, realising they were too remotely located to make a difference in the Galactic Civil War, decided that they would relocate and refurbish the long since abandoned Mos Veris. Not only would this be a statement of the return to power of the Empire on Valcyn, but it would be a homecoming of sorts for Alpha Company. As soon as Alpha Company had established their new secret construction in Veris, patrols into Bestine began. Then they began to stretch further into the Galaxy. This time A Coy was back, and not just to RP. With the population of the server greatly dwindling and the RP population almost non-existant, A Coy had decided that this time around RP was to be secondary, and combat became the new priority. Someone needed to clean up the galaxy, and it was A Coy that was going to do it. News quickly got round to former members as well as new recruits that A Coy was adopting a heavy PVP stance and before long A Coy would bolster a company of men once again. This time A Coy would only allow for the most dedicated members to stay in guild. A Coy’s decision to adopt an almost purely combative role couldn’t have better timing. The announcement that SOE’s new PVP Battleground "Battle for Restuss" on Talus would be launching soon, and A Coy would play a decisive role in that Battle. The battle began with A Coy dominating with anywhere from 25 to 50 players at a time arriving on the battleground. Often other guilds would don stormtrooper armour to keep continuity with A Coy’s uniforms, and engage in battle alongside them. A few videos were made and posted to Youtube which today remain popular SWG videos. A Coy even planned to make a mini series ala Red Vs Blue, but it never panned out. The intro to this series can also be found under the name "Sandbox Soldiers". For the first few weeks A Coy fought hard and much to the Rebel’s displeasure, would push them out time and time again from the city. After a few weeks, tensions would mount to claim that A Coy would "steal the show" and "get all the credit", so A Coy simply continued to fight and not comment. Those who enjoyed their presence would continue to support them, and those who didn’t would cry out to be left alone. Many would call A Coy "steamrollers " and a " zerg " guild. However, the jealous cries of the defeated would only echo on the forums and A Coy members were forbidden largely from partaking in the forum drama. Eventually A Coy’s leaders decided it was time to let the matter go and withdrew for a week from Restuss for some much needed rest. It was a rude awakening for the Imperials as the Rebels took full control of the city for that time and before long Imperials were begging A Coy to return. A Coy would return for several weeks to follow. As the battle for Restuss wound down, so did the population of Valcyn once more. For many members of the guild, the game began to lose its sparkle. The quality players long gone, game mechanics changed and changed again, all that was left was A Coy, and nobody to enjoy it. A Coy was formed as a guild made to enhance the player experience, and bring Star Wars to a Star Wars game. With nobody to enjoy it but themselves, A Coy decided to call it quits. A Coy would return once more and attempt to restart A Coy but it was doomed from the beginning. Members of the past did not have the motivation to carry on with SWG, many were fed up with Sony and the game itself, and two of the core leaders refused to return to the game. The player base was non-existent, and new "content" as simply re-published old content. The attempt at a 4th founding had failed. With so many new MMOs on the market, and SWG fading with its outdated graphics and gameplay, many players would not return and others found the draw to other games too powerful. 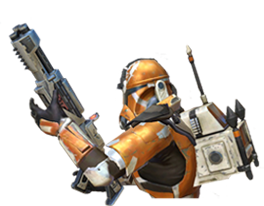 Many of the members who would stay with SWG would form a guild called the Remnant which would RP the "Remnant of A Coy". Many would continue with this until leaving the game later on. All information, content and materials contained on this site are the copyrighted property (unless otherwise noted) of Alpha Company Online.